My painful earaches had been unwelcome visitors for years. When I finally scheduled an appointment with my physician, I was symptom free. (Don’t you hate when that happens?) He ruled out infection, fluid buildup, and detected no redness or swelling. Alas, over the ensuing months, the intermittent symptoms continued. I felt so much pressure in my left ear that even the slightest touch on my pillow at night would hurt in an excruciating way. I could barely change sleep positions. Finally, after persistent complaints, my doc referred me to an Otolaryngologist, otherwise known as an ear, nose and throat specialist (ENT). The ENT palpated my outer ears, he listened to my jaw as I opened and closed my mouth. He asked me questions such as “How much do you chew gum”? I was surprised to find out that my earaches were symptomatic of TMJ disorder. An irritated masseter can trigger painful TMJ disorder. The TMJ is located in front of each of your ears. It joins the mandible and maxilla, otherwise known as the lower and upper jaws. We use this joint throughout the day (some folks more than others) to chew, talk, yawn, and bite. The masseter is the thick rectangular muscle in the cheek that functions to close the jaw. It is one of the four muscles of mastication, and considered the most powerful. Clenching and grinding of teeth, particularly under stress, or excessive gum chewing can overwork this muscle. Furthermore, the superficial masseter can refer pain to the face, lower jaw, and even the teeth. 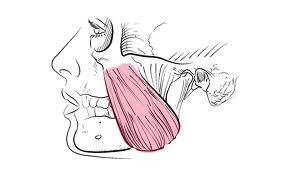 With TMJ disorder, the deep masseter refers pain to the ear. Physical symptoms and ailments can be great opportunities for learning. My education came from the very real lesson of proximity and pain referral. By becoming conscious and informed about the anatomy of the jaw, the source of my earache was identified. Yoga Tune Up® provides a simple Ball Therapy technique to relieve symptoms of TMJ disorder. If I feel my masseter beginning to spasm as signaled by ear pain, I immediately use my YTU therapy balls to massage out the pain (and you can try it yourself as demonstrated in the clip below!). This article originally appeared on YogaTuneUp.com.